After starting her football career in 1987 at Belnorth it didn’t take long for Amy Wilson’s ability to shine through. She was selected for the ACT rep training squad at U/14 level and soon moved through to the Australian U/16 squad after the Nationals in Bendigo. 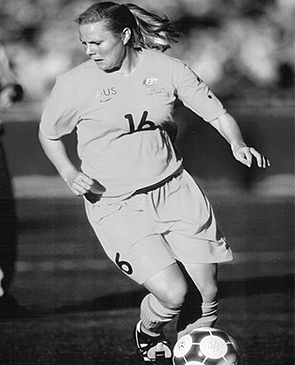 In 1995 Wilson became the youngest player to be selected for the Matildas at 15 and toured New Zealand, the start of an International career that lasted eight years until retirement in 2003 spanning the 1999 and 2003 FIFA World Cups. Coming back in 2014 for Belconnen United Wilson has been an inspiration to her younger team mates.